Like the consuming flames of a prairie fire the dread news spread: “The Spider has gone mad! He will massacre us all!” But Richard Wentworth, never more sane, was even then gambling life itself in one desperate effort to save the city which cursed his name — from the awful ravages of man-spread plague! Some writers fall into clover, but Norvell W. Page backed into a spider web that captured him for ten exciting years. Back in the difficult year of 1933, Page was working as a newspaperman and writing for the pulp magazines, when fellow pulpster mentioned that he was stuck. He had promised to deliver a horror novelette to the editor of Dime Mystery Magazine, but the deadline was too tight. So Page decided give it a shot himself. Page's timing was perfect. He not only scored the cover of that issue of Dime Mystery, but this was his first sale to Popular Publications, who had just launched The Spider, written by R. T. M. Scott. After two issues, Scott was moving on and editor Rogers Terrill desperately needed a replacement. Page was fast, wrote vividly, and made difficult deadlines. The job was offered to Page. His background as a crime reporter didn't hurt his resume either. The December, 1933 issue of The Spider ushered in the era of Grant Stockbridge with the thrilling Spider exploit, Wings of the Black Death. With his first white-heat story, Norvell Page owned the series. No doubt, he saved it from oblivion. In a few short months, Page remade Richard Wentworth alias the Spider into a messianic avenger unlike anything pulp readers ever read before. Driven, deadly, the Spider was a daredevil caught between the law that branded him as a criminal and the underworld he terrorized with his metallic laugh and searing lead. 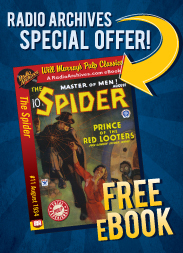 Radio Archives is proud to present Norvell Page's debut Spider exploit—a desperate struggle against overwhelming odds to save Manhattan from being overwhelmed by a man-made Plague. Read by Nick Santa Maria. Chapter 2: Spider, You Must Die! Chapter 15: Is That a Confession?